A bald eagle perches in a cottonwood above Highway 530 bridge in Rockport, Washington. Everett, Wash., Jan. 16, 2013—It isn’t an easy job: standing six long hours in rain, sleet, hail, sun and snow every weekend starting in December through January. 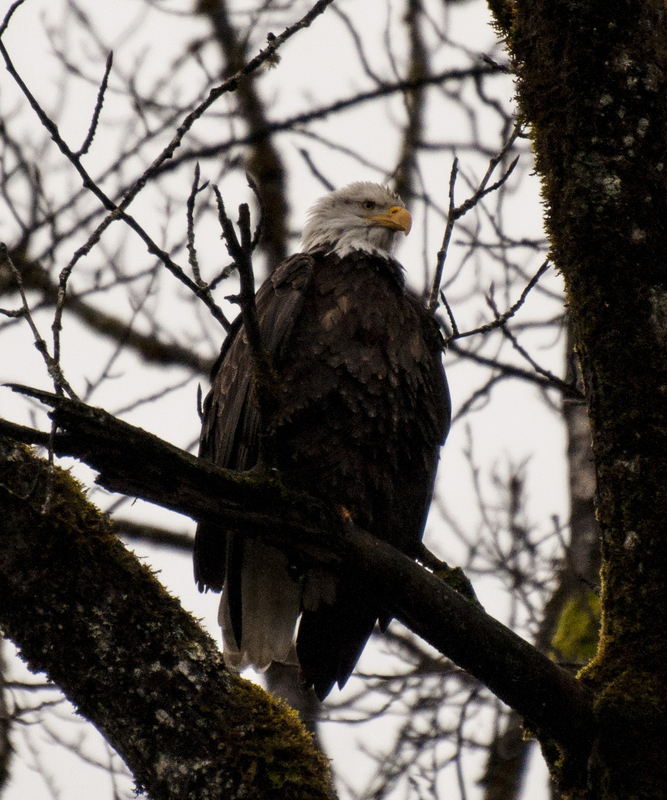 Armed with binoculars, spotting scopes and a love for bald eagles they greet and teach thousands of people who pilgrimage to Skagit River for a glimpse of eagles roosting in trees and eating fish along the banks. And these Eagle Watcher volunteers do it for free. 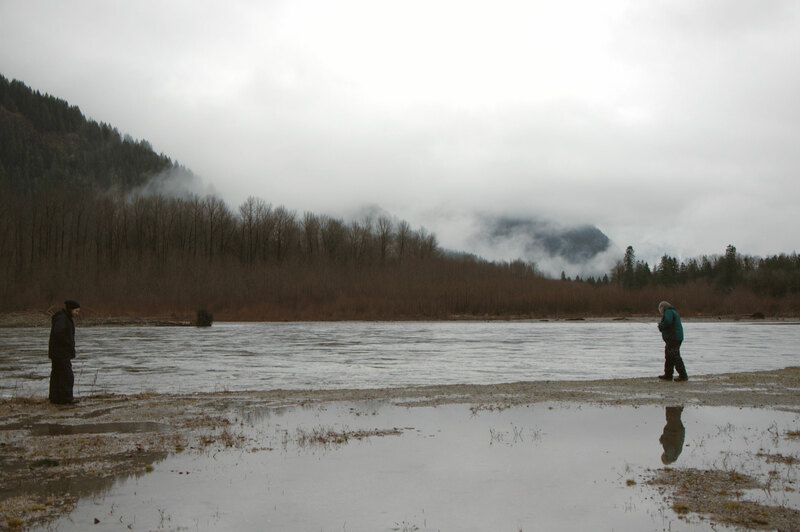 Eagle Watchers are stationed at three locations along the Skagit River on the North Cascades Highway: Howard Miller Steelhead Park near Rockport, Wash., nature viewing area at milepost 100 and the Marblemount Fish Hatchery. The Mt. Baker-Snoqualmie National Forest and North Cascades Institute created the program in 1992 to control crowding that disrupted the birds and caused traffic problems on the highway according to Tanya Kitterman. The Forest Service Eagle Watcher coordinator said the Skagit River watershed boasts one of the largest wintering populations of bald eagles in the continental United States. “The birds flock to the Skagit River for three reasons: the abundance of food, the river has good flows for spawning and it doesn’t ice over,” Kitterman said. Each year it takes 45 volunteers run the program, but most are eager to return, so she usually only needs to recruit about five people. All it takes to be an Eagle Watcher is enthusiasm about eagles and be an adult. “I bring the canopies, scopes, tri-pods and binoculars and they run with it. Their passion for the eagles is contagious,” Kitterman said. Harry Ota, a retired US army colonel who lives in Mt. 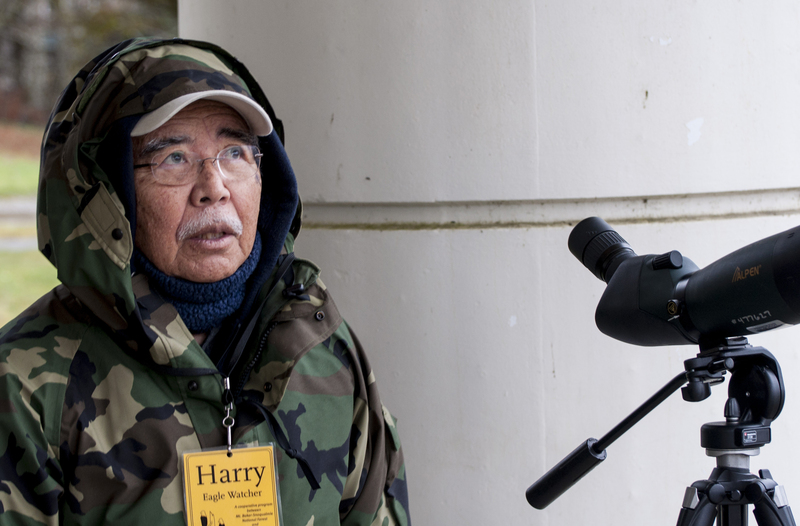 Vernon, Wash., is a 20-year veteran Eagle Watcher. “It beats getting cabin fever,” he said. He still gets ready for the season every year by digging out his reference books and reviewing old videos. Eagle Watcher Program volunteer Harry Ota scans for eagles at the Department of Fish and Wildlife hatchery in Marblemount Washington. “The eagles that arrive here are frozen out of their territory and food source up north and follow the salmon traveling south. It is amazing how nature works together. 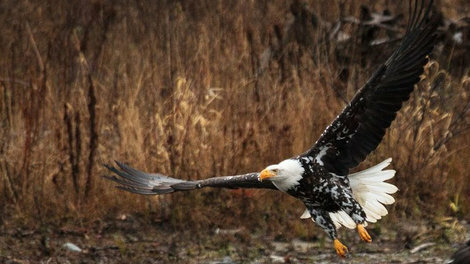 As one spawning route ends, another begins and the eagles move to follow,” Ota said. 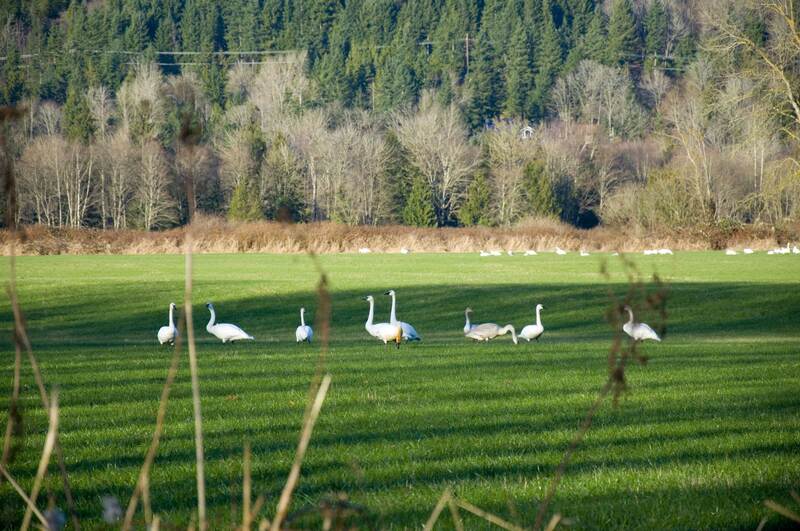 They are hungry when they arrive on the Skagit. “You’ve heard the saying about eating like a bird. Well, eagles are very voracious eaters and eat about a pound of meat a day. That is like us eating 40 quarter-pounders,” Ota said. The years of observing these birds have given Ota insight into the eagle’s behavior. He has noticed that some have become attuned to the presence of human activity. Although most will fly away from their meal when a boat drifts down river, some eagles just stop, guard their salmon, watch the boat pass and continue eating. “Eagles are incredible animals with personalities. They have a favorite perch they return to, just like we do. Some watch the world go by, others fight over food, and a rare few perform flybys worthy of jet fighters over the bridge near the Howard Miller Steelhead Park,” Ota said. In 2000 he got to help trap, tag and release eagles along the Skagit River for a Washington State wildlife research study. “Holding an eagle in my hands was an experience of a lifetime,” Ota said. They tagged 23 eagles and tracked them for five years. 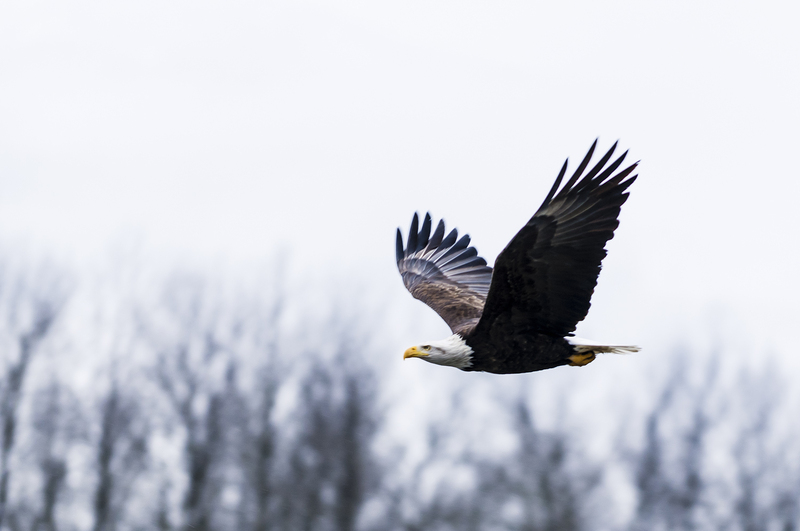 “The study discovered the eagles came from up north in the Yukon and were flying down the coast to northern California or east across the Cascades following the Yakima River,” he said. One of Ota’s favorite stories is of the eagles’ resiliency and recovery. “In the 1950s there was an estimated 412 nesting pairs of bald eagles in the lower 48 states. The bird was later listed as an endangered species. By the 1990s the eagle’s population had rebounded to an estimated 115,000 and was later removed from the endangered and threatened list in 2007,” he said. But Ota said what keeps him coming back every year is seeing peoples’ face light up when they view an eagle through the scope for the first time. “It is wonderful,” he said. You can view the bald eagles each weekend until the end of January. King 5 has the story and more photos here and here. Hat tip to Dave T. and Don K. for the scoop. I recently receieved a note from Aurora, friend of the eagle watcher program, with some information about a new bed and breakfast lodging opportunity in Sedro-Woolley. This could be a fun way to experience the Skagit Valley during the Eagle Festival over the next three weekends. We have a community-run house outside of Sedro-Woolley, right off of Hwy 20, a wonderful 9,000-square-ft house that has several fully furnished empty rooms. We’d love to have people come stay with us for one or several nights, on a sliding scale, depending on single or double occupancy and whether or not they would like breakfast. You can check out our website at www.thewoolleymammoth.wordpress.com, and anyone interested can email us or call (360) 856-2089. The place is quite a “destination site” in its own right! The river was big and fast this week! Here are the counts; they are up a bit from last week.